How long is fin effective? One final point: Like everyone else, I try to put all young men on finasteride for all the obvious reasons. It does not hold off the eventual hereditary pattern that man will get however. Some of us think it puts it off by 8-12 years or something of that order. So when a young man presents to see me at 23, 24, or even 26, who has been on finasteride for a few years, it is even harder to tell where he is heading, because the finasteride MASKS what would normally be happening if the patient weren’t on it. Some people on these forums comment as though going on finasteride somehow confers some permanent benefit for the young man. That is not true. It’s great for holding on to or even increasing the “native” hair for several years more than it would normally be around, but it doesn’t change the eventual long term picture. according to the 5 year study (i had a graph around somewhere), the first year and a half you take finasteride, hair counts and hair shaft diameter increases. those who don’t take finasteride see things going downhill rapidly. after the first 1.5 years, hair counts on finateride hit their max and then slowly start declining at the rate of 2% or so a year. this you might term the ‘natural rate of hair loss in men’. This is why its so very important to GET ON FINASTERIDE AS SOON AS YOU NOTICE mbp. The objective is to slow down your hair loss to a point where you can keep it for longer till the point they discover a cure for this sh&tty disease. Better yet, take Avodart which inhibits more DHT in the scalp than fin. Not taking the stuff is suicide in my opinion unless you have already lost your hair. There’s no coming back from that. » point they discover a cure for this sh&tty disease. » Better yet, take Avodart which inhibits more DHT in the scalp than fin. » your hair. There’s no coming back from that. my QUESTION is —Should i wait till the point FIN becomes ineffective and THEN switch to avodart? ?—right now i feel happier with fin and im having no issues!! for the midscalp and ONLY midscalp,im using minoxidil 2 % and its doing a great job too!! i hope it remains this way for me,coz right now im enjoying my hair!! I’d get on Avodart and alternate with fin. One day avodart, one day fin and stick with the minoxidil. Fin only inhibits about 30% of DHT in the scalp I believe but 70% in the blood stream. Avodart does a better job of inhibiting DHT in the scalp. I’d also shampoo with nizoral 2% about twice a week. I’m no expert so take my advice for what its worth. » and stick with the minoxidil. » blood stream. Avodart does a better job of inhibiting DHT in the scalp. » I’d also shampoo with nizoral 2% about twice a week. » I’m no expert so take my advice for what its worth. see the graph. although avodart is more effective than finasteride, it still only inhibits 55% of DHT in the scalp. i’d also recommend topical application of some dht inhibitor to increase that further. an ounce of prevention is worth a ton of cure when it comes to mpb. » still only inhibits 55% of DHT in the scalp. » an ounce of prevention is worth a ton of cure when it comes to mpb. i used to shampoo almost everyday b4 transplant but now i do it every third day…if shampoo plays role in washing out scalp DHT ,i guess i should do it more often!! » somehow confers some permanent benefit for the young man. That is not true. » the eventual long term picture. » IS THIS TRUE GUYS? I couldn’t formulate/describe it better than Dr. Beehner, because I experienced the same over the past 20 years. 20 years? Yes, 20 years. Because during my 20’s until 29 I didn’t had “Propetia” available and I just noticed a “very slowly and slightly thinning” over the top of my (NW-5) head until 30. So IF I would have been on Propetia in my 20’s, sure, I would thought that “I didn’t go bald due to Propetia!!”. But I didn’t went completely bald (just slighly thinning) in my 20’s - WITHOUT Propetia or something else. I was 30 (11 years ago) when I started to take Propetia and used it for about 2 years. Nothing changed, maybe EVENTUALLY, that Propetia thickend up my hair status a little bit. I stopped taking Propetia anywhere 7 - 8 years ago, as soon as I noticed that suddently my hair starts to thinning more - WITH the usage of Propetia (seems the clock in the hair cells started suddenly their program anyhow). I was about 35-36, suddenly I noticed my crown thinning too. I took Propetia again. Nothing happend until today(1mg daily since about 5 years and 1mg every 2 days since about 2 years). I partly agree but mostly disagree. There is a difference between scnescent balding (age related hair loss) and male pattern balding (androgen related). But propecia’s effect on the latter is clearly visible. Graph which shows propecia vs doing nothing below. Its was a 5 year ongoing study. With propecia hair loss is greatly slowed down. Not taking propecia and then taking propecia midway (crossover) also demonstrates its benefits) in slowing down androgen related hair loss. Note I did not say stopped but slowed down hair loss. I’d rather be on the dotted blue line at the top (propecia) than the diving black line below (doing nothing). The objective here is to take it as early as possible and hang onto your hair until a cure arrives. 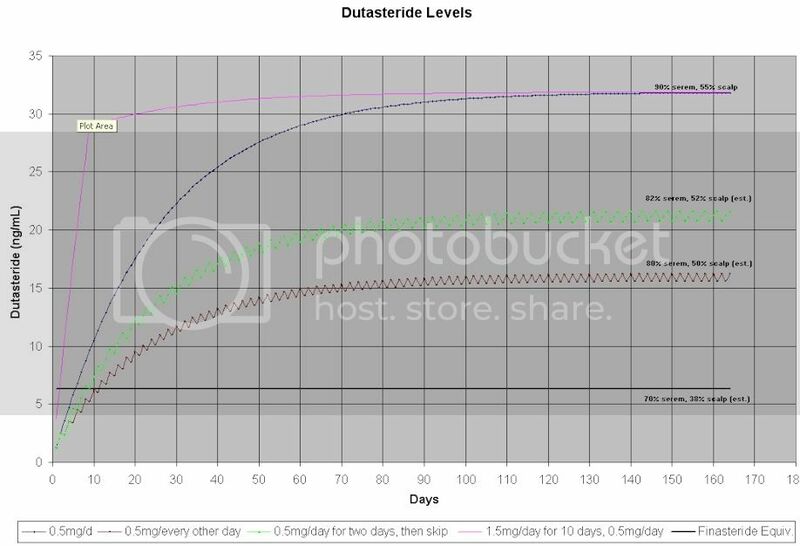 THIS is the graph that convinced me to take propecia and it was posted by Bryann Shelton 7 years ago. It was the graph that gave me hope. With avodart, that blue line at the top rises higher and I’m hoping stays flatter much longer. The important thing is taking it as early as possible, not letting 10 years slip by. Had I known this…I would have started on propecia at age 18!